Can I Collect Workers Compensation and Disability Insurance? Home » The Law & You » Can I Collect Workers Compensation and Social Security Disability? Can I Collect Workers Compensation and Social Security Disability? A viewer was recently in an accident at work that left him disabled. He’s currently on workers compensation but wants to know if he can collect money from another disability policy. Is it possible? Workers compensation lawyers Greg Fellerman and Ed Ciarimboli explain. 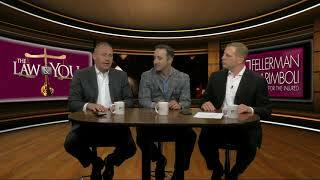 Dave Kuharchik: We’re talking tonight about getting injured in this edition of “The Law & You.” We’re back tonight in the virtual law center with attorneys Greg Fellerman and Ed Ciarimboli. Good to see you guys, tonight. Ed Ciarimboli: Today is my daughter Contessa’s 10th birthday. Dave: First year of double digits, of course, it’s a big one. Ed: Yep, big day. Last two weeks I said, “What’s going on? You see a little worried.” And she’s turning 10. Greg: It’s a big day. Ed: She’s out of the single digits. Dave: Well happy birthday. And here’s our question tonight. And this is from Victor from Drums. Victor says, “I had an accident at work that left me disabled. I am currently on workers’ compensation. Can I collect both at the same time?” What do you say to Victor? Ed: No. Generally speaking, the answer to this question is no. I mean there are some very, very small and limited exceptions. But if your disability is the same disability that you’re receiving workers compensation, then the answer is no. If you have a different disability from that which you were on workers compensation for, there is a possibility. But in this situation, the answer is no. Greg: He wasn’t clear, though, if it was a private contractional one because that could have a different ramification. But if it’s Social Security and workers comp, you can’t get. But in cases where maybe you have a private disability policy — because don’t forget with comp, you’re losing a third of your wages — so that can possibly make you whole. We need a little more information on that one. But it’s always good to have your own disability policy. You’re more likely to be disabled than killed, up to the age of 40. Dave: And for those who are injured, I know you guys really specialize in that. So they can reach out to you, give you a call, check you out online. And don’t forget results matter with attorneys Greg Fellerman and Ed Ciarimboli. We’ll see you next time, guys.